Enjoy great bar food, a fantastic whisky selection and lovely real ales and wines. 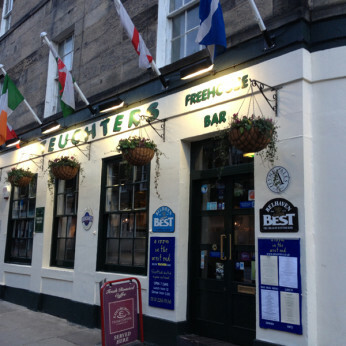 The perfect place to unwind after a long day shopping in Edinburgh or after work. Close to Murrayfield stadium. With a fine selection of real ales and the cozy atmosphere, Teuchters bar is the perfect place to unwind and relax after a busy day or week. Choose from an extensive selection of whiskies or enjoy a real ale by the fire. Fresh bean to mug coffee is also available and with a fully licensed restaurant downstairs there is something for everyone at Teuchters! Come and enjoy the incredible atmosphere within this Scottish bistro. We serve good quality food that is made from only the best fresh local ingredients. The bistro has gained a reputation for great seafood, game, steaks and vegetarian options. Based in the west-end of Edinburgh.